Flat and minimalism dominated the design trends last year. From logos and websites to architecture and UI, the flat style is everywhere. 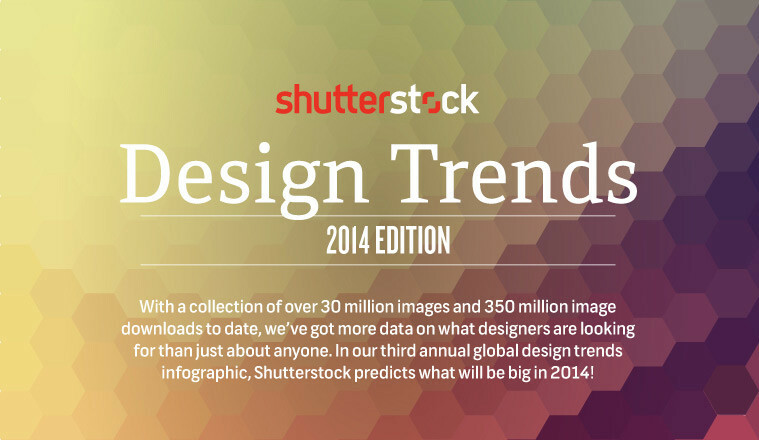 Will the design trend this 2014 be on the same track? Shutterstock, the popular online resource of commercial digital imagery, has released their annual global design trends infographic. Based on the data from over 350 million all-time image downloads, the infographic revealed the recent and emerging visual design trends across the globe. No two countries design alike. From pastel colors in China to vibrant textures in the Netherlands, unique themes around the world continue to emerge. Flat, minimalist design elements replace skeuomorphism. Led by changes in app and software design, downloads of flat design elements increased by 200% over the past year. Instagram-esque images were a top visual theme of the year. With the popularity of retro cameras and mobile apps, searches for filtered images soared 661% in 2013, with no signs of abating. Video is an increasingly popular medium for visual storytellers and access to new image-capture technology such as 4K is growing. Popular video content topics include education, 3D renderings, transportation and cityscapes. What design themes and styles do you think would emerge this year? Tell us via the comments below!